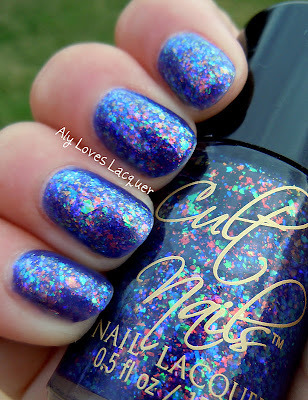 I was lucky enough to get my hands on a bottle of Cult Nails Unicorn Puke! This was sold as a very limited edition release of only 275 bottles. I woke up early and headed to the website to order right away, and ended up with bottle number 202. Unicorn Puke is a purple tinted base filled with lots of beautiful flakies. Given that purple is my favorite color and I love flakies, Unicorn Puke was basically destined to make its way into my top 20 polishes. I wanted to try Unicorn Puke on its own instead of layering it, and it took 3 coats to be opaque enough. True to Cult Nails formula, Unicorn Puke went on easily and didn't get clumpy or anything with 3 coats. 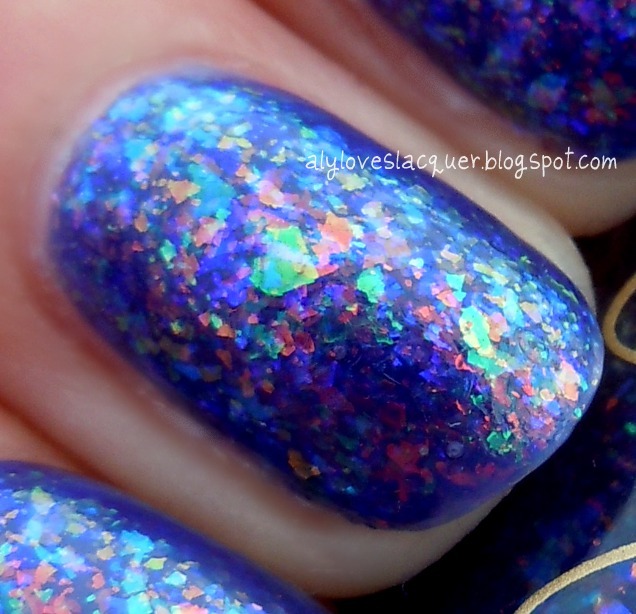 I was also amazed that all the flakies were completely flat on the nails. The purple base ended up having a nice jelly finish which adds lots of depth to this lacquer. On top I added Seche Vite to dry it quickly. Click these pictures! They are gorgeous up close! As you can see, this polish has lots of different sizes and colors of flakies. To me, it looks like it's mainly an orange/red flakie and a green/blue flakie. The base was sheer at first but was very buildable. Just for fun, I took a picture that includes the Unicorn Puke label. Isn't this the best?! I love the color, I love the flakies, and I love the funny name. Maria was right on with calling this one Unicorn Puke. It's cute and quite descriptive, if you ask me. 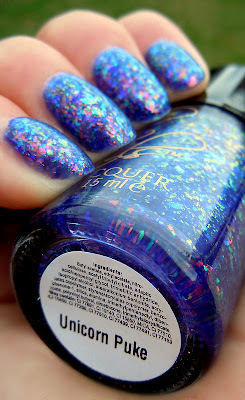 Did you manage to get your hands on a bottle of Cult Nails Unicorn Puke? If not, keep in mind that Cult Nails will be re-releasing it as part of their Winter collection under the (also awesome) name Clairvoyant. I love this nail polish! It is so much fun! So excited that I got my hands on one too. Did you see that it sold for $230 on ebay today!? Crazy!! I got this baby too <3 it's still on the way to me because a friend had to redirect it from the states to get it to me lol. can't wait! I'm so envious of you! I've heard on the grapevine that this is being re-released under a different name soonish. @Nicole, 7bridges, Ms Jelena - Thanks! @DandyNails - That is absolutely ridiculous! Especially since the color is being rereleased. That polish is amazing - I can't help to think how awesome it would look matte! I love this nail polish !